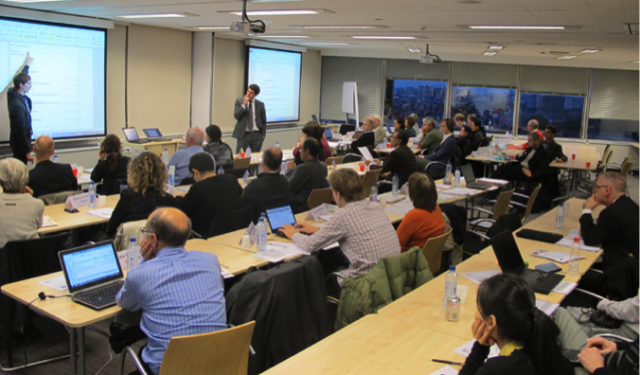 The COST Action was formally launched at a kick-off meeting held at the COST office in Brussels on October 29th-30th, 2012. The Management Committee elected Ursula Huws (UK) as the Chair of the Action and Christian Fuchs (Austria) as the Vice Chair. Jörg Flecker (Austria) was elected Leader of Working Group 1, Juliet Webster (Spain) Leader of Working Group 2, Eran Fisher (Israel) Leader of Working Group 3 and Pamela Meil (Germany) Leader of Working Group 4. Leopoldina Fortunati (Italy) was elected Short-Term Scientific Missions (STSM) co-ordinator and Vil Lehdonvirta (Finland) Leader of the Early-Stage Researchers Group. Rudi Schmiede (Germany) and Rosalind Gill (UK) were elected financial rapporteurs. It was agreed that the University of Hertfordshire would be the Grantholder for the Action. Image: Andreas Obermeier (COST Science Officer, left) and Leo Guilfoyle (COST Administrative Officer, right) explaining the COST procedures at the Kick-off Meeting.